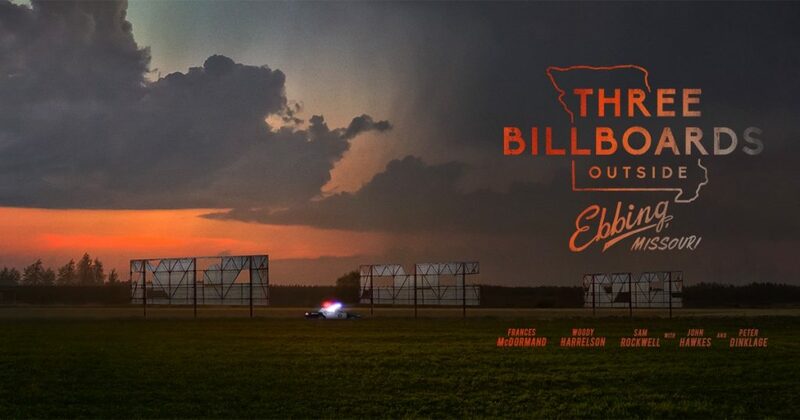 Three Billboards Outside Ebbing, Missouri – Film Review. Three dilapidated billboards that sit outside Ebbing, Missouri are recommissioned by Mildred Hayes (Frances McDormand) in a desperate attempt to incite local police Chief Willoughby (Woody Harrelson) into actively seeking justice for Mildred’s daughter, whom, seven months prior, was raped and murdered. So begins a plunge into a Southern rabbit hole full of moral depravity, black humour and a game of hide and seek with pathos. Martin McDonagh is a terrific writer of black comedy. His other affairs are brimming concoctions of humour, graphic violence, irreverent sexual encounters and prideful cynicism. The drama often scored the comedy with Seven Psychopaths and In Bruges but here, the subject matter is dramatic enough. The very serious battle against loss and the subsequent fight for justice only gains weight in the comedic moments as they more often than not, the laughter that could very well have been the tears. Especially true in everything Frances McDormand does as Mildred Hayes. Three Billboards is telling of the current cultural shift we’re experiencing. A woman on a mission, against injustice and attempting to hold idling, incompetent men accountable is so poignant of the now. But McDormand is no stranger to bringing intelligent, resourceful and three-dimensional women to life on the silver screen. Oh heck, look at Margie way back when in Fargo. So her performance here of a woman as hard as stone, indignant in injustice, staunch in her goal and refreshingly flawed is utterly deserving of the awards and nominations that come with this season. This isn’t McDormand’s look at me now moment as much as a don’t dare take your eyes off my career testimonial. McDormand is given so much to do, from repressed heartache, to comedic cursing at her children to an array of monologues that are symphonically cynical soundbites dissecting society, it is a wonder there’s anything left for anyone else. But there is, in spades. Most off the characters here are somewhat unhinged, idiosyncratic or bordering sociopathic. Thankfully there is an array of supporting actors on hand to fill these rickety boots. Woody Harrelson is droll but deep, bringing the Police Chief called out by Mildred away from bad cop, worse policeman, and into the silhouette of a terminally ill family man who can’t catch a break. The effervescent Sam Rockwell is delightfully dim as Willoughby’s subordinate lawman, Dixon. Although Dixon tries hard to vilify himself as a piggishly racist fascist whose badge is his free reign to accost and assault, he has an unexpected arc. The cliche of a small town cop is subtly subverted as McDonagh is like to do. Hayes, Willoughby and Dixon are intertwined in the pursuit of (in)justice, though their stories link in obvious terms to the plot, there is an unexpected shared spirit between each of them trying to do right by themselves and those they love. The pacing and direction here from McDonagh are one of the many reasons, amongst tight, inclusive cinematography and propulsive editing, that Three Billboards is an awards contender. And, of course, the intricate, layered screenplay. There is an abundance of social commentary and stabs at the mainstream establishments that is a McDonagh watermark but also a personal and profound feel to the picture as a whole. Asking questions of morality, empathy and justice to name but a few before the real zinger which seems to present itself absolutely, What would you do in any of their shoes? Three Billboards is a film that sticks with you. Not in a melodramatic way where you can’t stop crying or that the action scenes are to be dissected with friends. Three Billboards is a meditation of humanity as a human being. And what catharsis one chooses to deal with events that challenge individual humanity. Somehow these broad strokes are painted in comedic colours. A verifiable juggling act of artistry and craft.